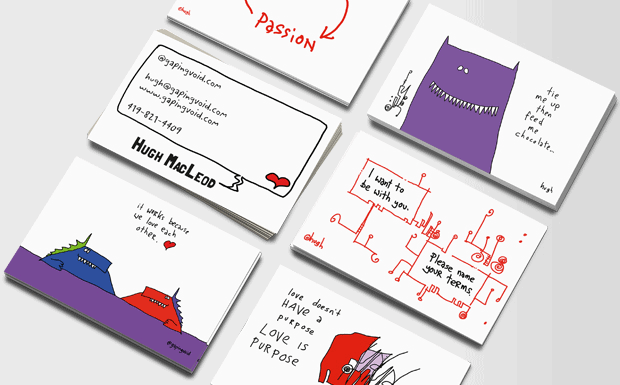 Home / Business Cards / new thoughts on p.r. I’ve gotten really interested in the PR industry recently. I do see a new breed. PR used to be based on the top-down principle of managing a few relationships with senior journalists or stakeholders. These respected authorities would say good things about your business or firm and the world would gratefully receive their view and act accordingly. Well as you know, that world got blown up and the new democratised world of the enfranchised consumer and the occasional angry crowd has forced businesses (and the PR people and firms that advise them) to open up. It used to be in this business that you could trade on who you know, and now it has swung much more to what you know as well. I can’t imagine hiring people these days who are not actively engaged in the conversation or community in some form . You can’t fake this stuff. And so that means we always look for technical skills, people with a wide set of interests and a passion for something (other than work). Richard Edelman calls this ‘Living in Colour’… the idea that if you only live for the office and home you become a little grey. And if you cut off from the world in that way, you are much less use to our clients, who are looking for insight and advice and connection. And then there’s my personal evolution over the last few years. 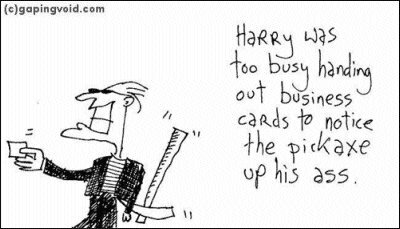 When I fist starting blogging a decade ago, I just posted new cartoons. Then I started writing about my trade at the time, advertising. Then over the years I got into writing about marketing and entrepreneurship, especially as it applied to blogging and Web 2.0. And I learned a lot about all of that, simply by blogging about it, reading other people’s blogs, “joining the conversation”, and trying to apply it all towards my own business. "live in the market, not in the spreadsheet"
An honest opinion from someone who never thought they would work in “PR”. I believe that this whole “social” thing is a revolution that at the end of the day gets people talking directly to people again. That’s simplified of course but it means working better, listening, innovating, co-creating etc. I don’t care what type of company I work at as long as the individuals I find myself in the trenches with believe the same thing. And that’s where I find myself. I think the PR industry still suffers from the perception witnessed in your cartoon, but I think that type of PR person represents the tip of the iceberg. It’s what people often see, but it doesn’t represent the massive number of smart people out there practicing PR. And what, exactly, is PR nowadays? I work for what would be called a PR agency but reaching out to press now comprises just a portion (the % varies) of what we do. Look at my blog, the things I write about blur into advertising, mobile, marketing, digital, PR, branding, etc. The world of PR has changed dramatically over the last several years, I think you’ll like what you find. Most PR people simply love making connections and writing and want to help clients get their story told. And PR is usually arguing for honesty and open access. After all, it was the PR exec who was urging Toyota to come forward with the bad news when others wanted to keep it quiet. 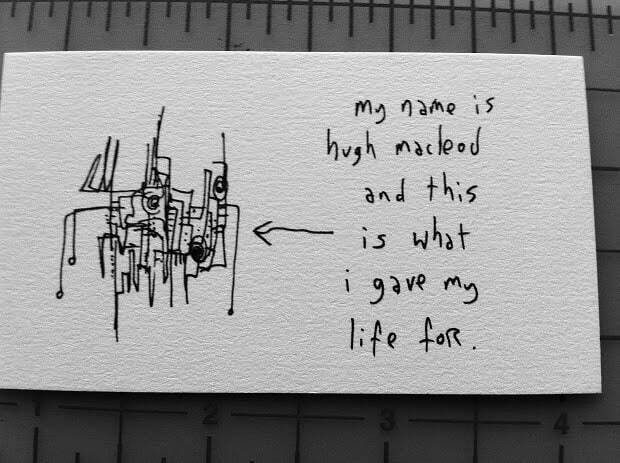 Great insight into the evolution of the @hugh brand. The conversation you had with David and the softening of the pick axe mentality a bit. The industry is changing from the elitist trickle down to being more of a how can we work together kind of thing. None of us are perfect and continue to learn. How do you plan on incorporating more PR into your writing? As someone who comes from the corp and non-profit world (and a not-so-closeted social media geek now) – I’m searching for the PR Firm who will play a much more strategic role in connecting brands and blogs and philanthropy. Triangulating that relationship gives a halo to the corp client (for “doing good”) that extends their brand, traffic to the blogger (as well as a better base for a relationship with a brand), exposure and gift dollars to the non-profit, a sense of effecting things to the reader/participant and creates an actual relationship model everyone can be proud of at the end of the day. Hugh, I agree with Rick about the evolving nature of PR, going well beyond press releases and media relations. It’s about making connections, even ones as simple as adding feedback to a blog post. I also think David’s comment about things going social, person to person connections is on the mark. I’ve always maintained that anyone who works with people, deals with valuable publics and audiences, is already in PR (whether they know it or not). FWIW. I agree with Tracy. PR done right is about connecting and being authentic. Social media tools will help with customer engagement. Happy customers can be the best spokespeople. That is why Facebook is adding its new “like” function. I think the PR business is genuinely at a crossroads – which is what makes it just about the most exciting place to be in the comms industry/ hierarchy right now. The new vanguard will, in quick time, move a long way from those still suffering from ‘pickaxe syndrome’ – and rightly so. It’s a healthy and important debate – I blogged about it a couple of months ago on Citizen Renaissance – here: http://www.citizenrenaissance.com/2010/02/15/the-rat-the-squirrel-and-chimes-of-freedom-flashing/.